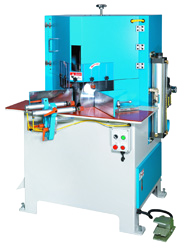 Specially designed for cutting high workpieces a miter saw features over pivot type. Saw blades feed vertically. Maximum height of cutting is 200mm. 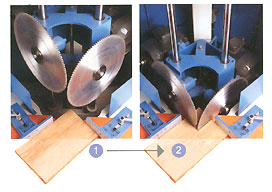 Two staggered saw blades are positioned at 45 vertically to reduce workpiece waste to a minimum. Especially ideal for notching applications that permit workpiece stack cutting for greatly upgrading efficiency. Saw blades move vertically on two precision Shafts. assuring consistent cutting. Compensation for sawblade wear is easy to adjust. 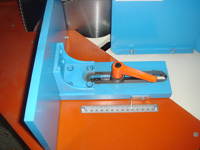 Saw blade height is adjustable for saving time of cutting.